Slightly Off.. where you can hear great old tales about great old whales, tango 'til you're sore to the haunting sigh of an actual saw, dance along with magically animated gypsy bones, listen in on the conversations of dead lovers and attend a circus put on by a snake headed man called Deek, a bearded lady named Dove and her loyal dog called Creep. 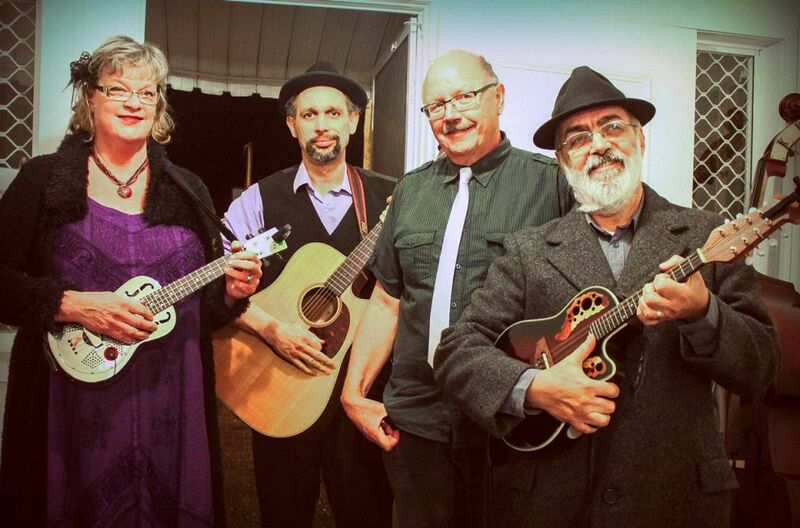 Slightly Off is a refreshingly different Central Coast musical act, presenting an avante garde' style of entertainment. With their collection of obscure and original murder songs and manic ballads, they love to make the audience laugh and keep them wondering what will happen next. Carl plays guitar and sings in a none-too-delicate style while Leila plays an assortment of instruments, including the tenor banjo, clarinet and musical saw, sings and acts up. Cec Bucello adds his talented voice and mandolin to the slightly askew mix. Ken Grose adds his "cool" style with the bass line. For Slightly Off, the most important aspect of any performance is for the audience to have a good time.